* Senior club appearances and goals counted for the domestic league only and correct as of 03:48, 28 March 2016 (UTC). Marlon Anderson Harewood (born 25 August 1979) is an English footballer who plays for Nuneaton Town as a striker. Harewood started his career at Nottingham Forest. During his career there, he had loan spells at Haka and Ipswich Town before joining West Ham United in 2003 and then Aston Villa in 2007. In 2009 he spent short periods on loan at Wolverhampton Wanderers and Newcastle United. In 2011 he was on-loan with Barnsley and completed a six-month contract with Guangzhou R&F in China League One. Harewood is a product of the Nottingham Forest youth system, and made his league debut in 1998. In the same year, he acquired experience abroad with a successful loan spell at Haka of the Finnish Veikkausliiga, winning both the Finnish championship and the Finnish Cup. In 1999, he had a further loan spell with Ipswich Town, scoring one goal against Bury in six appearances. Harewood went on to forge a reputation as one of the most lethal strikers in the First Division. He scored 51 goals in 124 league games and 58 substitute appearances for Forest and also scored four goals in 23 cup appearances. He formed a brilliant attacking partnership with close friend David Johnson. They scored 50 goals between them, of which Harewood netted 21 goals including 4 in one game against Stoke City, to fire Paul Hart's Forest into the playoffs for the 2002–03 season. He caught the eye of West Ham fans when he scored for Forest in an FA Cup Third Round clash at Upton Park on 4 January 2003. However, Harewood's contract was due to expire in summer 2004 and having been offered a worse contract than he was already on, rejected it and decided to leave. He joined West Ham United in November 2003 for a fee of £500,000. After signing for West Ham, new manager Alan Pardew hoped that the powerful striker could have a similar effect on the Hammers promotion hopes the following season. Harewood was the top scorer for West Ham in 2004–05 with 23 goals in all competitions. He returned to top flight football following West Ham's playoff victory at the end of the 2004–05 season, and the 2005–06 season saw Harewood spearheading Pardew's Premiership attack. He scored 14 league goals, including the first top flight hat-trick of the season in a 4–0 home victory against Aston Villa and also put West Ham in front after just 52 seconds against Manchester United also at Upton Park. Harewood became one of the top scoring strikers of the 2005–2006 season and after scoring the winning goal in the FA Cup semi-final against Middlesbrough, Harewood responded by saying, "I can't really describe how I felt at the time; you can't put something like that into words, it's a chapter in my career that I have dreamed about doing since I was a little kid. After making the big step-up from Nottingham Forest to West Ham, I knew I had to work hard if I wanted to get to where the top strikers in the country were." Harewood collected an FA Cup runners-up medal with West Ham that season, after they lost on penalties following a 3–3 draw with Liverpool. He was also the club's top Premier League goalscorer with 14 goals. Following a torrid run of results for West Ham, including a defeat to League 1 side Chesterfield in the League Cup, Harewood scored a dramatic last-minute winner against title-hopefuls Arsenal in November 2006. This subsequently resulted in a highly emotional confrontation between the two managers. In May 2007, Harewood confirmed that he would leave West Ham in the summer after falling out of favour at the club. In July, it was confirmed that Harewood was in talks at Aston Villa's training ground and his agent, Mick McGuire, said, "Marlon has been in talks with Villa and everything should be concluded soon. Villa have come in at the 11th hour to take him." Harewood joined Aston Villa on 17 July 2007 for a fee of £4 million and signing a three-year deal. Harewood said, "I was all set to sign [for Wigan] on the Monday when I got a phone call saying Martin O’Neill wanted to speak to me. I might have had a better chance of getting into Wigan’s first team, but, with no disrespect to them, when Martin O’Neill phones you up asking you to join a massive club like Aston Villa, and he’s explaining what he wants to do and how he wants to go about it, that sold it to me.". Harewood scored his 100th career league goal as Aston Villa beat Blackburn Rovers 4–0 at Ewood Park on 28 November 2007. Harewood continued to be a fringe player at Aston Villa throughout the winter and eventually scored his second goal in the 2–2 draw with Liverpool in January. His spirited substitute appearances for the club often turned games around and lead to him becoming a fan favourite at Villa Park. The chant "Feed the Hare and he will score" rang around the Madejski Stadium after he scored Villa's second against Reading on 24 February 2008. Despite his good performances from the bench Martin O'Neill continued to use him as a "super-sub" (albeit he did start against Manchester United due to injury troubles). He scored his first goal at Villa Park in a 4–0 victory over Bolton and scored again the following week in a 6–0 win away to Derby County. His next Villa goal did not come until October when he scored in a 1–1 draw with Litex Lovech in the UEFA Cup. Harewood found his chances even more limited during the 2008–09 season. He did not start a single Premier League match, and of his fourteen appearances in all competitions, eight were as a substitute. The goal against Litex Lovech was the only time he scored that season. After the arrival of Emile Heskey at Villa Park in January 2009, newspapers started speculating that his time at the club was coming to an end, with rumours of a move to Stoke, Sheffield United and Middlesbrough. He eventually left Villa on loan, joining Wolverhampton Wanderers of the Championship for the remainder of the season on 23 March 2009. He played five games for Wolves without scoring before returning to Villa Park. 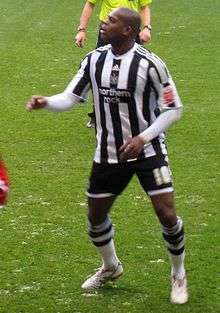 On 24 September 2009, Harewood joined Championship side Newcastle United on a three-month loan until December. He made his debut on 26 September 2009 in a 4–0 win over Ipswich Town, coming on as a substitute for Nile Ranger in the 64th minute. His first goal for the Magpies came, in a 1–1 draw, against Queens Park Rangers on 30 September 2009 in the following game. He then scored a brace to help Newcastle win 3–0 against Swansea City on 28 November 2009 and keep the Magpies top of the table. He scored his fourth of the season coming in a 2–2 away draw at Barnsley. His fifth of the season came on 20 December 2009, scoring the opening goal in the 2–0 win Tyne–Tees derby at St James' Park. Following his return to Villa from Newcastle, Harewood was injured and unable to play for the rest of the season. Aston Villa decided not to renew his contract at the end of the season. Following his release from Villa, Harewood was linked with a number of clubs in the media including Turkish Süper Lig club Bursaspor and MLS side D.C. United. Despite this, he joined up with newly promoted Premier League side Blackpool in early August 2010 and soon entered talks with the club about a permanent deal. Phil Sproson, Harewood's agent, later revealed that talks had broken down between the two parties and that Harewood would not be joining the club. Despite this, the player and agent re-opened talks with the club and on 11 August he signed a two-year deal with Blackpool. Two days later he scored twice as Blackpool marked their Premier League debut with a 4–0 win over Wigan Athletic at the DW Stadium – their first top division game since 1971. On 10 November, he scored on his return to Villa Park in a 3–2 defeat to Aston Villa. It was his fourth league goal of the campaign, which made him Blackpool's top scorer. He was released by the club on 25 May 2011. Harewood joined Barnsley on loan on 26 February 2011, until the end of the 2010–11 season. He scored his first goals for Barnsley in a 2–1 win over Scunthorpe United on 8 March 2011. On 8 July 2011, Harewood signed a six-month contract with China League One club Shenzhen Phoenix (the club's name later changed to Guangzhou R&F). He made his debut on 9 July in a 2–1 home victory against Yanbian Baekdu Tigers, coming on as a substitute for Wen Chao in the 55th minute. Harewood scored 4 goals in 10 appearances as Guangzhou R&F finished second place in the League One and won promotion back to the top flight at the first attempt. After trialling with his boyhood club, Nottingham Forest, Harewood signed a four-month contract and began his second stint with the club. Harewood played six games, none on the winning side, in all competitions for Forest without scoring before his contract ended. Since his departure from Forest, Harewood has been training with Sheffield Wednesday with a view to signing permanently. On 14 August 2012 it was announced that Harewood would be returning to Barnsley on a one-year deal, following an injury to Egyptian striker Mido. On 17 May 2013, Barnsley manager David Flitcroft announced that Harewood's contract would not be renewed with the club. On Saturday 20 July 2013, Harewood featured as a trialist for Bristol City in a pre-season friendly against Forest Green Rovers at The New Lawn. and featured again on 29 July against Weston Super Mare, scoring a first half brace in a 3–1 win. On 2 August 2013, Bristol City announced they had signed Harewood as a free transfer until the end of the 2013–14 season. He scored his first and only goal for the club in a 2–1 defeat to Brentford on 22 October 2013. Harewood signed for Hartlepool United on 13 January 2014 until the end of the season, following his release from Bristol City. On 1 March scored his first goal for Hartlepool United. Breaking from the halfway line, he scored their third goal in 3–0 win against Torquay United. In May 2015, Hartlepool announced that Harewood was being released by the club at the end of the 2014–15 season. Harewood signed for Nuneaton Town on a one-year contract, on 10 July 2015. Harewood was born and raised in Hampstead, London, to parents that had emigrated from Barbados. In February 2008, Harewood rejected a call-up to Barbados for the two-legged 2010 FIFA World Cup qualifier against Dominica, deciding to concentrate on his club football with Aston Villa. ↑ "The Football League Retained List". The Football League. 12 June 2015. Retrieved 16 June 2015. 1 2 Hugman, Barry J., ed. (2003). The PFA Footballers' Who's Who 2003/2004. Queen Anne Press. p. 214. ISBN 1-85291-651-6. 1 2 3 "Forest can cash in on Harewood". Nottingham Evening Post. 6 June 2007. Retrieved 10 June 2007. ↑ "Bury 0 Ipswich 3". Sporting Life. 6 February 1999. Retrieved 6 December 2009. ↑ "Marlon Harewood". Racing Post. Retrieved 28 June 2007. ↑ "Hammers hold off Forest". BBC Sport. 4 January 2003. Retrieved 10 June 2007. ↑ "Harewood seals Hammers move". BBC Sport. 25 November 2003. Retrieved 8 June 2007. ↑ "West Ham 4–0 Aston Villa". BBC Sport. 12 September 2005. Retrieved 10 June 2007. ↑ "West Ham 1–2 Man Utd". BBC. 27 November 2005. Retrieved 2007-06-10. ↑ "Middlesbrough 0–1 West Ham". BBC Sport. 23 April 2006. Retrieved 10 June 2007. ↑ "Chesterfield 2–1 West Ham". BBC Sport. 24 October 2006. Retrieved 10 June 2007. ↑ "West Ham 1–0 Arsenal". BBC Sport. 5 October 2006. Retrieved 10 June 2007. ↑ "Harewood ponders Upton Park exit". Premier League. 1 May 2007. Retrieved 10 June 2007. ↑ "Harewood in talks". AVFC. 6 July 2007. Retrieved 6 July 2007. ↑ Moxley, Neil (17 July 2007). "Villa in late for Hammers' striker Harewood". Daily Mail. London. Retrieved 17 July 2007. 1 2 Lansley, Peter (18 July 2007). "Harewood happy to fight for his place after £5m transfer to Villa". Times Online. London. Retrieved 18 July 2007. ↑ "Striker signs". Aston Villa. 17 July 2007. Retrieved 17 July 2007. ↑ "Potters pursue Harewood". Sky Sports. 7 January 2009. ↑ Dall, James (20 January 2009). "Harewood won't leave top flight". Sky Sports. ↑ "Wolves Complete Deal For Harewood". Wolverhampton Wanderers. 23 March 2009. ↑ "Newcastle sign Harewood on loan". BBC Sport. 24 September 2009. Retrieved 24 September 2009. ↑ "United complete Harewood loan swoop". Newcastle United. 25 September 2009. Retrieved 25 September 2009. ↑ "Ipswich 0–4 Newcastle". BBC Sport. 26 September 2009. Retrieved 20 December 2009. ↑ "Newcastle 1 – 1 QPR". BBC Sport. 30 September 2009. Retrieved 1 October 2009. ↑ "Newcastle 3–0 Swansea". BBC Sport. 28 November 2009. Retrieved 20 December 2009. ↑ Cass, Bob (28 November 2009). "Newcastle 3 – 0 Swansea". London: Daily Mail. Retrieved 28 November 2009. ↑ Dawkes, Phil (20 December 2009). "Newcastle 2–0 Middlesbrough". BBC Sport. Retrieved 20 December 2009. ↑ "Frustrated Aston Villa striker Marlon Harewood weighs up DC United and Bursaspor moves | Mail Online". London: Dailymail.co.uk. 27 May 2010. Retrieved 11 August 2010. ↑ "Football | Premier League | Blackpool | Harewood set for Pool talks". Sky Sports. 7 July 2010. Retrieved 11 August 2010. ↑ "Football | News | Pool miss out on Harewood". Sky Sports. 10 August 2010. Retrieved 11 August 2010. ↑ Watt, William (11 August 2010). "Harewood signs for Blackpool". Blackpool Gazette. Retrieved 11 August 2010. ↑ "Wigan 0 – 4 Blackpool". BBC Sport. 14 August 2010. Retrieved 15 August 2010. ↑ "Blackpool offer a contract extension to Charlie Adam". BBC Sport. 25 May 2011. Retrieved 25 May 2011. ↑ "Harewood joins Tykes". Sky Sports. 26 February 2011. Retrieved 26 February 2011. ↑ "Barnsley 2 – 1 Scunthorpe". BBC Sport. 8 March 2011. Retrieved 9 March 2011. ↑ "Marlon Harewood signs for Chinese team Shenzhen Phoenix – report". goal.com. 9 July 2011. Retrieved 9 July 2011. ↑ "Nottingham Forest sign Marlon Harewood on short-term deal". BBC Sport. Retrieved 30 December 2011. ↑ "Soccerbase – Marlon Harewood 2011–12". www.soccerbase.com. Retrieved 8 July 2012. ↑ "Harewood agrees Barnsley deal". Sky Sports. Retrieved 14 August 2012. ↑ "Harewood Departs". Barnsley F.C. Retrieved 17 May 2013. ↑ "Forest Green 0–1 Bristol City". Gloucester Citizen. 21 July 2013. ↑ "Marlon Harewood and Marlon Pack sign deals". BBC Sport. 2 August 2013. Retrieved 2 August 2013. ↑ "Bristol C 1 – 2 Brentford". BBC. 22 October 2013. Retrieved 18 January 2014. ↑ "Transfer window: Marlon Harewood joins Hartlepool United". BBC Sport. 13 January 2014. Retrieved 13 January 2014. ↑ "Hartlepool 3–0 Torquay United". BBC Sport. Retrieved 2 March 2014. ↑ "Harewood released by Hartlepool". Sky Sports. Retrieved 18 May 2015. ↑ "Marlon Harewood: Former Villa striker signs for Nuneaton Town". BBC Sport. Retrieved 11 July 2015. ↑ "Marlon Harewood: I stopped enjoying football at Aston Villa". The Guardian. 11 September 2010. Retrieved 6 June 2014. ↑ "Harewood turns down international football to concentrate on Villa career". Daily Mail. 11 February 2008. Retrieved 6 June 2014.